Volume 5, Edition 10 Trouble loading? View this email online. 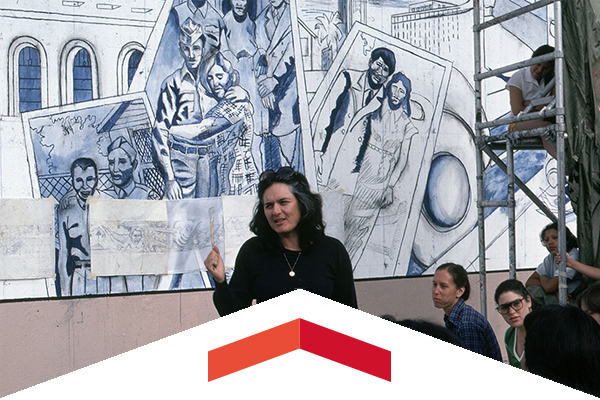 Judith F. Baca’s Experimentations in Collaboration and Concrete highlights the collaborative processes and aesthetic innovations central to the world-renowned painter, muralist and CSUN alumna’s The Great Wall of Los Angeles. No matter how hard she and her mother dreamed it, going to college in the United States hardly seemed a reality for Eloisa Varela. 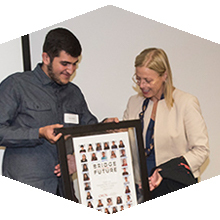 That changed when Varela was accepted into CSUN’s Bridge to the Future program, which provides up to 25 high school graduates per year a tuition-free CSUN education. 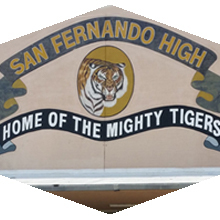 CSUN faculty and their community partners are taking the fight to boost college readiness and accessibility for Los Angeles teenagers to one of the largest public high schools in the Los Angeles Unified School District. It is a demonstration site for expanded teacher training, college counseling and parent workshops. Thur, Oct. 19, 7 p.m. Fans receive free admission with a clothing donation to benefit MEND, which helps relieve the effects of poverty by providing basic human needs while giving individuals the education and training that fosters self-reliance. Sat, Nov. 11, 7 p.m. The Soraya (formerly known as VPAC) celebrates a milestone for one of LA’s most innovative dance companies with an entire day of programming, starting with a free outdoor community festival at 11 a.m. At 7 p.m., the Great Hall performance features awe-inspiring pieces from three separate eras of the company’s history. Thur, Oct. 19, 11 a.m.
Cantor Kenneth Cohen of Temple Ahavat Shalom will present a brief survey of Jewish music and the cultural influences and diversity of its development at this free event. Matador Madness 2017 set the tone for the coming basketball season with introductions of the Matador men’s and women’s basketball teams and plenty of action on the Blacktop at the Matadome on Oct. 13. A tax expert from H&R Block will be at CSUN to talk about credits and special circumstances that will help educators get the most out of their tax returns. Come out to compete or just have fun at the pool tables at House of Billiards in Sherman Oaks. Participate in our costume contest and come to hear about our reinvigorated chapter. We will be announcing new leadership and talking about the exciting new direction of the chapter, including plans we have to grow it and how you can help us impact current CSUN students. CSUN’s Finance, Insurance & Real Estate Alumni Chapter is hosting a get together for alumni at Far Bar in the heart of Little Tokyo. We have a back patio reserved for you to make connections and learn about professional opportunities all while unwinding for the evening. Looking to make your military experience stand out and your resume memorable, be successful in an interview, or advance your career? Mark Brenner, founder of the Veteran’s Career Xchange, CSUN alumnus and military veteran, will be visiting CSUN to host a careers workshop to specifically address veterans’ resume translation, interview tips and tricks and more. After the 2016 El Niño, Coral Reefs in Moorea Are Thriving — Why?